In the Strikotherm EWI systems. Embed the Strikotherm ‘Fijn/Fine’ alkali-resistant glass fibre into the mortar with an overlap of at least 10 cm and smooth down with a stainless steel trowel so that a system-bonded layer thickness is reached with the glass fibre layer in the upper half of the layer. Take care to ensure that the glass fibre is continuous through the layer and is sufficiently embedded. 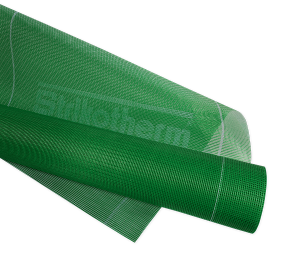 Since the diagonals of wall openings such as doors and windows create the largest thermal stresses, use Strikotherm diagonal fabric strips there. These fabric strips are applied for hot application of the mortar-fabric layer.